Jean Afterman talks with New York Yankees outfielder Aaron Judge. Afterman is in her 18th season with the Yankees, and was a player agent prior to becoming MLB's third female assistant general manager. She's also a senior VP. In 2018, MLB earned a gender grade of C on the yearly report card issued by The Institute for Diversity and Ethics in Sports. Essentially, that means 30 percent of employees in pro baseball are women. 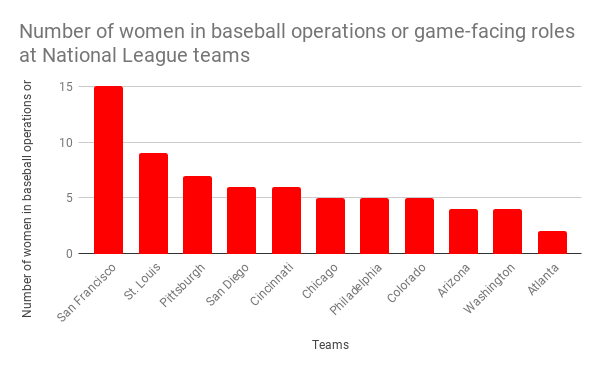 But MLB told KCUR that just 188 women work in baseball operations roles, doing things like looking for the best talent, negotiating contracts or scouring data to optimize player skills. That encompasses jobs in the commissioner’s office plus all 30 teams and those teams’ minor league systems. And in 150 years of Major League Baseball, no woman has been a general manager or a head coach (aka a manager). New York Yankees’ Jean Afterman is one of only three women who’ve risen to the assistant general manager level. “I've been honored to sometimes be referred to as a trailblazer, but it's pretty exhausting when you blazed a trail and there's nobody following up behind you,” said Afterman, who is 62. While the conversation about gender parity may not be new, there’s a renewed focus. The NFL’s Tampa Bay Buccaneers just hired two women as assistant coaches. Notre Dame women’s basketball coach Muffet McGraw, who recently declared she was done hiring men and advocated for making sure more women become leaders in sports. And ESPN analyst Jessica Mendoza, who like other women broadcasters, has been criticized for showing off her baseball smarts, joined the New York Mets’ baseball operations staff as an advisor about a month before the season started. There is no single definition of “baseball operations” across Major League Baseball. Twenty-four of the 30 MLB teams confirmed to KCUR how many women they had in such roles, though some teams counted media relations staff, and most counted administrative assistants (who often help with contracts and other important front-office functions). These teams responded to KCUR's request to provide the names and titles of women who work at the major-league level. The number doesn't include broadcasters with TV or radio affiliates. The Baltimore Orioles and Los Angeles Angels of Anaheim either didn't respond to KCUR's inquiry or declined to give a count. 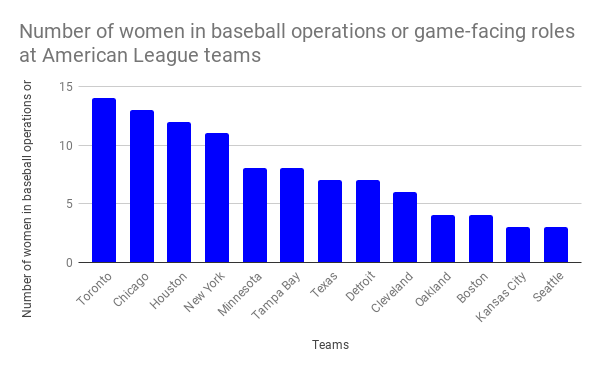 The Kansas City Royals are among the top five teams when it comes to women working in baseball operations roles at the major- and minor- league levels, MLB said. But on the KC-based team, there is just one woman working with the players: dietitian Erika Sharp. “But it, it's just a typical day and they all treat me like their little sister. They call me little sis sometimes,” she said. Sharp, 30, is in her second season with the Royals, having previously worked with the San Francisco Giants and Arizona Cardinals. She said she’s been lucky in that she hasn’t felt like her gender has been a determining factor, though she acknowledged that her profession is generally dominated by women. These teams responded to KCUR's request to provide the names and titles of women who work at the major-league level. The number doesn't include broadcasters with TV or radio affiliates. The Miami Marlins, Los Angeles Dodgers, New York Mets and Milwaukee Brewers either didn't respond to KCUR's inquiry or declined to give a count. As MLB's Chief Diversity Officer, Renee Tirado oversees a number of initiatives to bring more women and people of color into all levels of the sport, from front offices to the field. Diversity programs may not always work as expected. A 2016 Harvard Business Journal report noted that as initiatives increased in the U.S., the percentage of white women who became managers increased by 7% from 1985 to 2000 and black men only budged by .3% from 1985 to 2014. And by diversity, “we’re talking about who is part of the organization and who is not a part of the organization,” said Geraldine Cochran, an assistant professor of physics at Rutgers University who has written about and advocates for diversity and inclusion efforts. The Harvard report said that the most effective diversity initiatives rely on recruiting, mentoring and a diverse management staff, but Cochran insisted there’s another component, too: examining whether the efforts are making a difference. “There is no-one-size-fits-all diversity plan that's going to work at every organization. It needs to be an iterative process of making the changes, and then doing research to see if those changes were actually successful, and doing research to find out where the actual problems in the organization are,” she said. Diversity initiatives weren’t a thing when Greg Pryor played in the majors in the 1970s and 1980s with the Texas Rangers, New York Yankees, Chicago White Sox and the Royals. “I came through baseball when it was very rare to see a woman in the front office or very visible as they've been in regards to a baseball,” said Pryor, who remembers when women in the media were just being let into clubhouses. The only woman he said he dealt with from a team standpoint was Nancy Faust, the organist at Comiskey Park in Chicago. “A lot of times in baseball, that change comes very slowly,” Pryor said. He said he thinks fathers are encouraging more daughters to go into the sports they love (his youngest included; she used to work in the NFL). 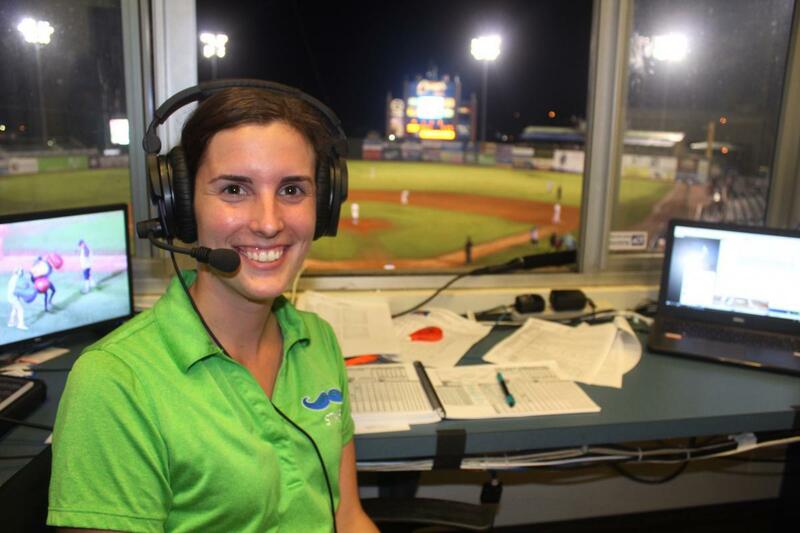 Emma Tiedemann is the Lexington (Kentucky) Legends' play-by-play announcer and director of media relations for the team, which is the low-A affiliate of the Kansas City Royals. She's been broadcasting sports since she was 15. Among the up-and-comers is Emma Tiedemann, who is with the Royals’ low-A minor league team in Kentucky. The 26-year-old has broken the gender barrier a couple of times already: in 2014 with the Alaska Baseball League and in 2018 in the South Atlantic League. Today, She does both the play-by-play and color during radio broadcasts for the Lexington Legends. But there were barriers. She had a minor-league baseball team tell her they wouldn’t hire her because she’s a woman. The Yankees’ Afterman said she still feels it necessary to “sort of justify myself” in meetings, even though she’s a senior vice president, has been an assistant GM for 18 seasons and negotiated contracts for star baseball players such as Hideo Nomo and Alfonso Soriano for several years before that. The 25-year-old previously worked in the health care sector as a developer, and said her experience since recently joining the Reds (her own dream) is that “nothing feels abnormal” because they’re working toward the same goal. “I'd say any, not even fears but whatever the step before fear is, that I might have had about working in an office — a baseball office — where (it’s) dominantly male and the sport is all played by men, I've not come across anything that would make me concerned,” she said. But even with the MLB’s Diversity Pipeline Program, the fellowship program and an initiative called Take the Field (a two-day event that helps builds relationships between teams and the women looking to be in baseball operations, coaching or umpiring), Tirado said progress will be slow. That’s because, she said, MLB is at the foundational stage. Baseball is a small world. Teams like humans, prefer familiarity in the hiring process, and what’s familiar is men. Some of the encouragement is going to have to come from women like Tiedemann, who reaches out to any new woman broadcaster in baseball in hopes that they succeed. Maybe they’ll even beat her to the major leagues, where currently there’s one woman who’s a color announcer (Suzyn Waldman with the Yankees’ WFAN team) and one woman who’s a public address announcer (Renel Brooks-Moon with the San Francisco Giants). “I would love to not be a story,” Tiedemann said. Rather, she wants to be “just background noise,” kind of like a walkup song or the call of a hot dog vendor in the section over, just part of the game. This story was corrected on April 12, 2019, to show that Pryor's daughter previously worked in the NFL, not currently. Erica Hunzinger is an editor at KCUR 89.3 in Kansas City, Missouri, and the editor of Harvest Public Media. Follow her on Twitter: @ehunzinger.